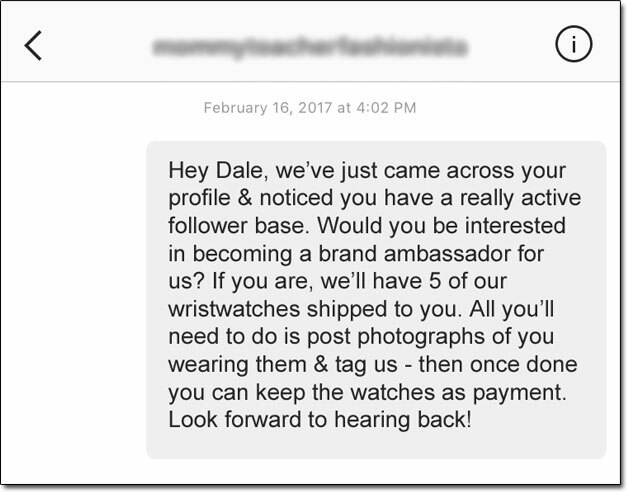 What Is The Instagram Brand Ambassador Scam? In short the Instagram brand ambassador scam is not actually a new scam, it’s a scam that’s been around for many years but it’s merely taken a new form in the hope of catching more people out… And sadly it seems to be working! The scam behind it, known as the pay for shipping scam basically just preys on its victim’s excitement and/or desperation. Sounds good right? You get sent the watches (which on average tend to cost around $80 a piece) & all you need to do is take some photos of yourself wearing them, then tagging the brand when you post them on your Instagram. If you do that, then they’ll let you keep the watches as payment… So that’s 5 watches which equates to around $400… Not bad huh? If you follow up on their initial message then they’ll continue to hype up the potential opportunity, telling you how great the watches are & how much they’re worth… But they’ll also mention that in order to get the watches you’ll need to cover the shipping. Being that they’re only watches the shipping fee will only be around $5 to $10 or maybe up to $20 at a push – and this is exactly where the con lies. Even though that deep down you likely know there’s something dodgy going on they’re merely hoping that their offer sounds so good that you’ll just be “tempted” into paying the seemingly small amount of cash to see if it’s actually legit (which I can 100% confirm it isn’t). So you’ll end up losing $20 or so as a result… But they’re doing this to literally thousands of different people every single day – so the guys behind these brand ambassador scams are earning thousands of dollars every day from their unsuspecting victims. Which is why I want you to take a moment right here & now to share this post with any of your friends. Share it on Facebook, Twitter, wherever you can & make as many people aware of this scam as possible. But how do you spot a legit Instagram brand ambassador opportunity from a fake one? To be honest, the answer is pretty simple and there are 2 rules that you should go by… The first one is the good old “if it sounds too good to be true, then it probably is“… And the second one is that you should NEVER have to pay anything upfront. If a person or company is telling you that you need to pay anything upfront to get on board with their brand ambassador ship opportunity (no matter what the excuse is) then it is likely a fraudster trying to scam you. Is it the official account of the brand? Does the account look new? Is the account following a suspiciously large amount of people? No doubt it will be when you take a closer look into the account that you come to realize it is definitely not real – but even then it can be hard to tell the difference as some of the fraudsters accounts can be pretty convincing. And many of the scammers often take advantage of this by creating their own, such as @nikegiveaways (just a fictitious name I’ve used as an example) – through which they promise to giveaway free goods to anybody who shares the profile on their own page. Sadly though this is just a trick that the scammers use to build a big follower base in a short amount of time, and then once they’ve gained that follower base they then move on to pushing these brand ambassador pay for shipping scams. You see the problem with most brand ambassador deals is that they just offer one-time payments… So it’s a case of “post this & we’ll pay you this” – then once you’ve posted it it’s job done, then they simply move onto looking for other influencers to get them to do the same. That’s no good for you though because although you’ll have had a one-time payment, once that’s paid you’re not going to be getting any more money unless you actively seek other brands to pay you again. Recurring income or pay per sale income sounds much better right? Well that’s exactly what you can get through affiliate marketing. And by introducing recurring income or pay per sale income you’ll be able to leverage your efforts & massively scale up your income – which is pretty much the same way I managed to build an income of around $10,000 per month. And just in case you don’t know what affiliate marketing actually is, it’s basically where you promote 3rd party products or services in return for commissions. So for example the likes of Amazon have an affiliate program which you can sign up to – and if you do then you get a unique link to their products which you can share… Then as per the image below if somebody clicks that link & makes a purchase, you get paid. Affiliate marketing is a truly great way to make money in general but it’s without a doubt one of the best ways to make money from Instagram. Plus if you’d like to get started with it & learn more you can do so for free over at Wealthy Affiliate (which I highly recommend). So yeah, if you do have a relatively large follower base on Instagram (or know how to get one) then affiliate marketing is definitely something you should look into as if done properly it’ll definitely take your income to new heights. I kinda wandered off topic there a bit with the whole Instagram & affiliate marketing thing but I just wanted to reign myself back in & discuss how you can go about getting your money back if you’ve already fallen victim to the brand ambassador scam. Because if you have lost money then I’m pretty darn sure you will want it back! However sadly this is where I’m potentially going to be the bearer of bad news, because how you can get it back (and your chances of actually successfully getting it back) depend on how you made the payment in the first place. If you made it via a bank transfer then sorry, but your chances of getting it back are pretty darn slim. I’d definitely recommend contacting your bank & seeing if there’s anything they can do, but often most bank transfers are final & there is very little protection surrounding them. The same goes with Bitcoin – if you paid with Bitcoin (or any other cryptocurrency) then sorry, but the money’s probably as good as gone. If however you made the payment by other means through a 3rd party merchant such as PayPal then you may be in luck – because you have an intermediary you can contact that often has the power to reverse the funds. PayPal are excellent at this, so if you paid with them you’ll likely have a strong fighting chance of getting your cash back… Just log on in, find the transaction & click the dispute button. But when you do open your dispute though it’s vital that you provide as much information as possible. All too often I hear stories of people leaving sentences like “been scammed, need money back” in their dispute comments & whilst it may be the truth, it’s not going to really do much for your case… So write exactly what happened, what you thought you were going to get & the important bit, which is what you actually got. 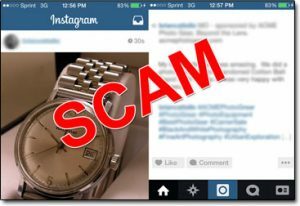 I strongly hope that my post here exposing the Instagram brand ambassador scam has given you a good insight into how it all works & more importantly I hope it has helped you to avoid falling victim to it. What I will point out though is that like I said at the start of this post the “just pay for shipping” scam in general is not a new scam & the Instagram version of it is merely it’s latest form, so you should still stay vigilant elsewhere (and apply the golden rules I mentioned earlier in this post to any opportunity you come across online). Some other known pay for shipping / processing fee scams I’ve already exposed that you should watch out for include the Legit Flex Job Academy & Envelope Work programs. Steer clear of those if you happen to come across them. But to summarize, hopefully the information I have put here on this page has been useful & hopefully it’s also given you a good insight into how you can legitimately make good money from Instagram too. What Is 1DollarAdz.com & Is It a Scam or Legit? Read My Review! Is Lyoness a Pyramid Scheme? Scam Busted? My Review Reveals All! Millionaire Blueprint Review – Hmm I Don’t Think So!